Posted on Sat, Feb 18, 2012 : 9:38 a.m. 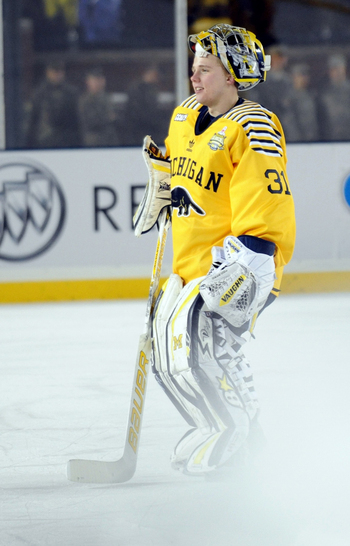 When Shawn Hunwick joined the Michigan hockey team as an unheralded, unrecruited walk-on, he harbored hope that by his final year in Ann Arbor he might be able to get some minutes on senior night. Hunwick thought that if he stuck with it, worked hard in practice and proved a capable backup throughout his career, the coaching staff might throw him a bone and let him skate with his classmates one final time in front of the home crowd at Yost Ice Arena. When Hunwick takes the ice against Northern Michigan on Saturday (5:05 p.m., FSD), it won’t be a feel-good cameo. He’ll do so as the heart and soul of the Michigan hockey team. One of four seniors to be honored as part of senior night on Saturday, the loudest ovation from the Yost faithful will likely be for Hunwick, the team’s lone Hobey Baker candidate. Michigan goalie Shawn Hunwick smiles after shutting out Michigan State, 5-0, in the Big Chill at the Big House in December 2010. Hunwick got a surprise start that day when Bryan Hogan was injured in pregame warmups and would go on to establish himself as one of the top goalies in program history. It’s a far cry from Hunwick’s first ever appearance on senior night two years ago, when he filled in for an injured Bryan Hogan and recorded his first ever win. At the time, Hunwick -- now a fifth year senior -- didn’t think he’d even be on the team for the 2011-12 season. He certainly didn’t think he’d be the Wolverines all-time leader in save percentage (.927) and goals against average (2.09) and in the top 10 for both wins and shutouts. He’s not the only one. Coach Red Berenson is the first to admit he never would have guessed Hunwick would be where he is today. He gets a child-like grin when talking about the journey Hunwick’s made since filling in on an emergency basis two years ago. The stars aligned for Hunwick. Hogan outplayed him at the beginning of last year before another injury -- and Hunwick’s play during said injury -- gave him the job again. Even coming into this year, Hunwick’s spot wasn’t guaranteed until top prospect John Gibson decommitted from Michigan to turn pro. "You talk about taking advantage of opportunities, and he's doing it," Berenson said. When asked about his feelings about Saturday, Hunwick downplayed the significance. Because of how’s he’s played since that first senior night, he’s done his part to make sure Saturday isn’t that significant. Because of Michigan’s positioning in the CCHA standings, it’s not likely to be his last game at Yost, and if Hunwick and the Wolverines continue to play as they have, there is still a lot of hockey left to play this year. If you would have asked him two years ago if he'd be announced as the starter on his own senior night, Hunwick would have called you crazy. Sat, Feb 18, 2012 : 6:04 p.m.
Great great story, and carried them to an unlikely CCHA tourney win to keep their streak into the NCAA Playoffs going. He continues to cover up some slips by the M defense, but Michigan is playing their best now heading into the stretch.